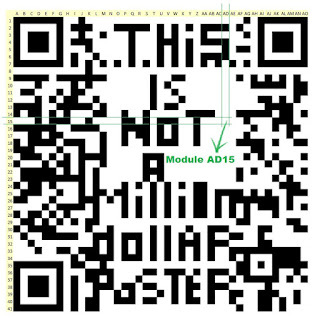 A collaborative crowdfunded Conceptual Art poster made of QR Codes. A game with Mysteries to solve. Click on the banner to visit the Crowdfunding Campaign. Click on the photo below to see the final working prototype. It WORKS. You can even read/scan it on your screen. 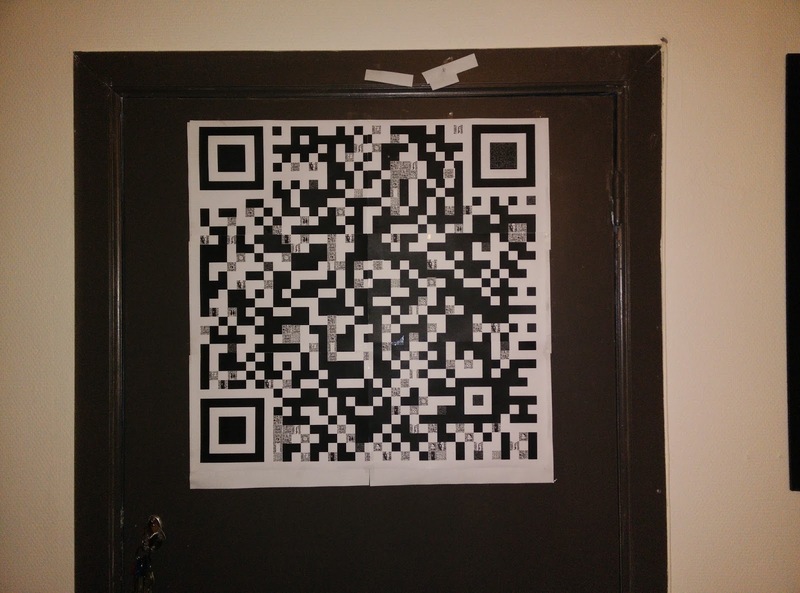 This prototype is made of 6 *A4 printed pages (cut to adjust) and make a giant QR Code of 53*53 cm (21*21 inches). The regular poster is 24*36 inches (61*91 cm). So expect the square of the giant QR Code to be 60*60cm. That's 12% larger. 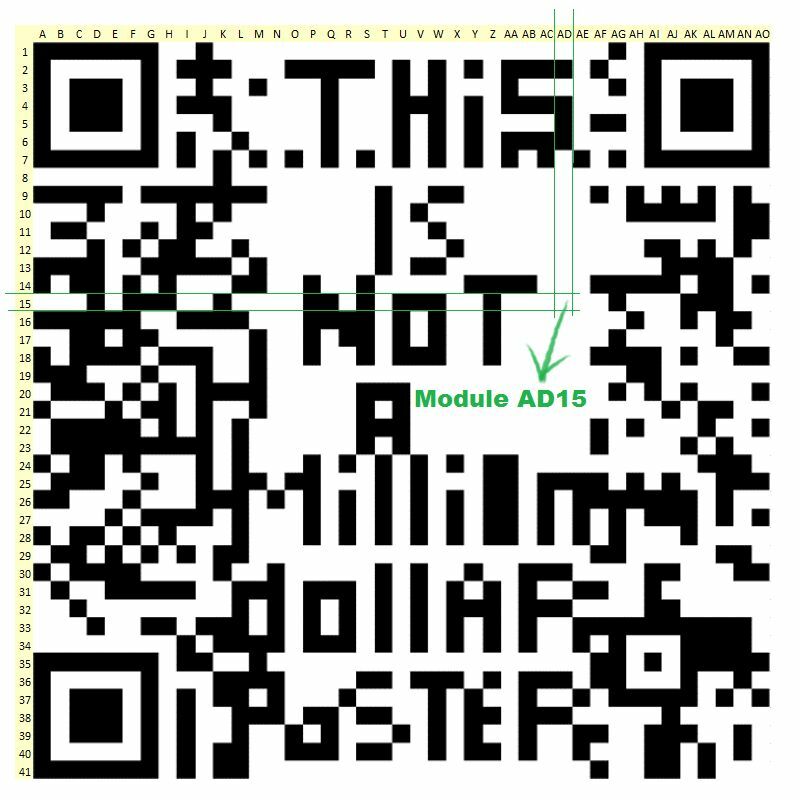 The QR Code will be 37 blocks (called modules) wide, so that a little above 16mm side for a tiny QR Code. Most smartphones now (80%) have a large enough photo sensor, coupled with autofocus to read easily a 15mm large QR Code. The poster will be made to look nicer than the prototype but the BEAUTY of the poster is not to be SUPER BEAUTIFUL but to attract the eye. 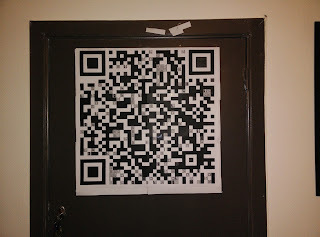 The passer-by or friend will be curious and will want to scan a few QR Codes to know where it leads. Explore the poster and of course find out about the symbols and mysteries hidden in the poster and solve the game. I will do the updates on the Kickstarter platform during the campaign. These are public but some might be only for backers/supporters. You can become one for just $1 and have fun with learning about the creation process of the poster and the fun updates I plan to do. After the campaign I might do updates on both this blog and to all backers of the campaign of course. Some explanation here about the QR Code. It will be made of 37 by 37 modules (squares or blocks, pixels if you prefer). Each module has a name like in a crossword. An example below to find Mod AD15. This is what means [location] on this page where future QR Code backers will have their own QR Code located. But not only QR Codes will be hidden in modules. Other information and clues to solve the mysteries. More about this later during the campaign. You expected me to tell everything now? Check the campaign updates as everything will happen there. Contact us for Direct Advertising here with a JPG/PNG/GIF banner. QR Code is a registered trademark of DENSO | (c) Louis-Philippe Loncke. Powered by Blogger.